He's coasting. he can't be gone soon enough for me, and i ain't talkin' about Millar this time. So are you under the belief that managers do have more influence on a team's win/loss record than maintaining clubhouse harmony and ensuring batters get their at-bats and pitchers their requisite innings? Clubhouse harmony by clearly favoring inferior players? Getting at bats like John MacDonald or innings like Dirk Hayhurst? I'm not of that belief, I simply feel all the credit from last year and this spring were undue especially in the face of his beyond reproach perception in the media etc. I'm guessing they promised Millar a certain amount of playtime when they signed him. I think you're right and it makes me want to become a Giants fan FULL TIME. Would anyone object to that? Giantsrunner on First? The slurping I'd give Timmy would embarrass even the staunchest fanboys. You keep mentioning the inferior players. Who else would you have liked to see? Obviously Accardo over Hayhurst, but Accardo has clearly pissed someone off. Who instead of J-Mac? You were the one who said Ruiz couldn't hit up here. Millar has $50k bonuses at 200, 250 and 300 PAs, which, to me, is inconsequential. Maybe they'll just get him to 250 (he's at 239) and let him go - to avoid the bad rep with agents of cutting people just prior to bonus clauses being reached. But yeah, I'm with Drew. It isn't that I don't want to see Hayhurst or MacDonald, I don't want to see them just sit on the roster doing nothing. 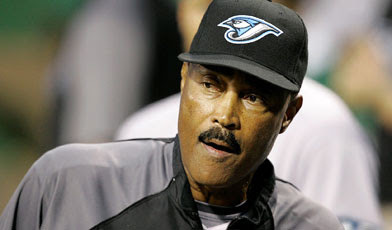 Early in the season it was Cito's stubborn refusal to jigger with the lineup that "worked", now it is his refusal to get away from guys that aren't contributing. In the long wrong none of it is too terribly important, I just hate to see anyone get a free pass while everyone around him catches hell. Early in the season the left side of the infield was absolutely on fire. J-Mac's sitting for that reason. Cito's stubborn refusal with Wells and Rios was due to the fact that he figured it was a slump, not a season long funk. Wells has spent the most time this season in the 4-spot. In front of Adam Lind. Protection. It worked for Wells before, when Delgado was behind him. There's the logic there. Finally, mercifully, when it was clear Vernon 2009 is full of FAIL, he was moved. Who would have thought Scoots would put together a season like this? I'm sure Cito figured to use PMoD at SS, but when the Jays come flying out the gate and Scoots is a big part of it, Scoots isn't going anywhere. Even though I don't like that Overbay is a platoon player, it was done for a reason. He's batting .194 against lefties. Hello shittacular Kevin Millar. Now that these jobbers - Millar, Bautista, EE - have to play, it's Cito's refusal to get away from guys that aren't contributing? There are no other options. He's used everyone at his disposal when he's had to. I don't see Cito getting a free pass. Parkes has been shitting on him since Day 1. Stoeten takes shots at him. The Tao and The Ack both are furious with his moves. I've questioned his ways too. I just don't think he's THE problem. That being said, I don't think there is ONE problem. There are many. Cito can be part of the solution. Stupid BR tables, I have yet to find a way to copy/paste them in without spending hours altering the HTML to make it look half decent. GAH! This comment has nothing to do with the aftermath of his comment in '04, but...Millar has a drinking problem. You can see it during on and off days: when he's on he's clean shaven; off and he's bearded and scruffy. The numbers match as well.